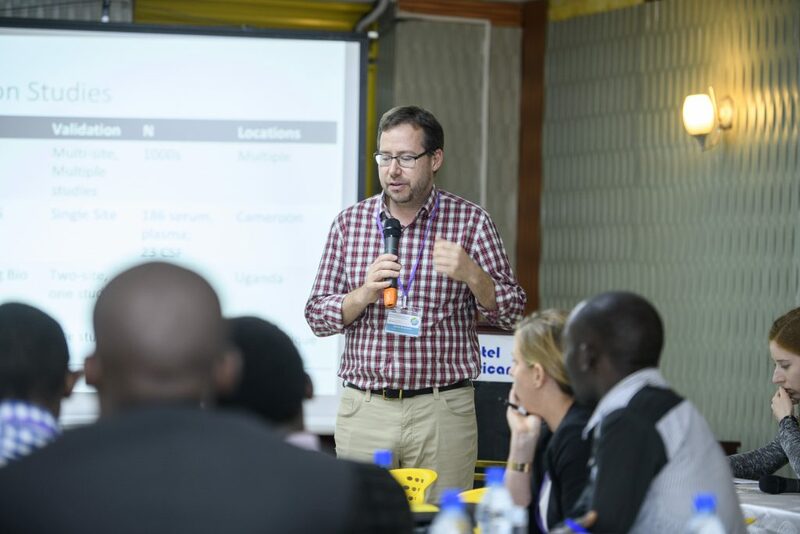 In association with the Global Advanced HIV Disease Consortium (ADC), GAFFI convened the third Global Fungal Infection Forum in Kampala, Uganda between 10th and 12th April 2018. The objective of the meeting was to gather experts and review evidence on available in vitro diagnostics for HIV/AIDS-associated opportunistic infections and serious fungal diseases for inclusion in the World Health Organisation List of Essential In Vitro Diagnostics (WHO EDL). The meeting was timed to precede and help inform the WHO’s Strategic Advisory Group of Experts on In Vitro Diagnostic (SAGE-IVD) meeting. An initial selection was made to focus on key non-culture diagnostics, i.e. TB urinary antigen (LAM), cryptococcal antigen, Histoplasma antigen, Aspergillus IgG, Pneumocystis PCR and Toxoplasma IgG/IgM and one on antifungal therapeutic monitoring. Summary arguments were also presented for culture based diagnostics and direct microscopy. 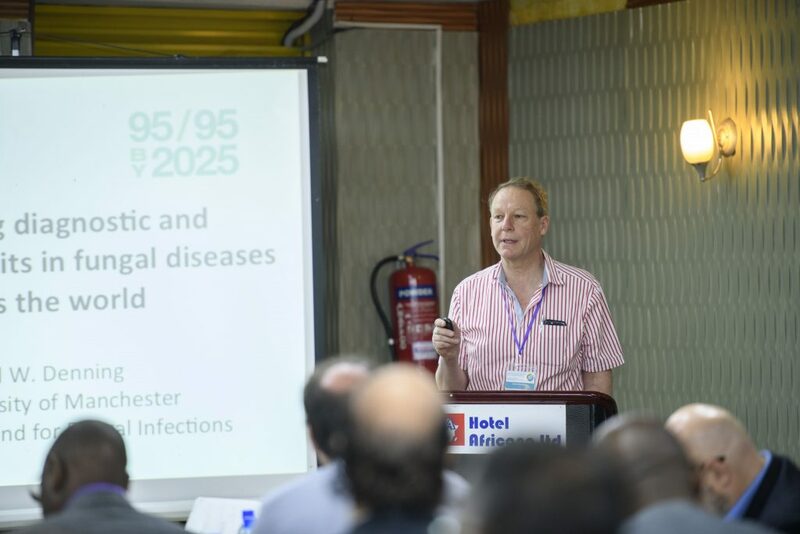 In addition, twelve keynote talks on advanced HIV disease, difficult clinical cases with diagnostic considerations in advanced HIV, importance of measuring CD4, laboratory systems strengthening, antimicrobial empiricism, and quality assurance systems for the selected diagnostic tests. Ninety-five experts in HIV, Microbiology, Mycology, Parasitology, Public Health and laboratory sciences were invited from LMICs, global organisations, research institutes, academic institutions and diagnostic and antifungal marketing companies globally to develop consensus on which tests should be deemed ‘Essential’, with a primary focus on LMICs, and non-culture based tests. Key considerations were test performance, simplicity of use and clinical impact. Abbreviations: LMICs: low and middle income countries. MICs: Middle income countries. LICs: Low income countries. ELISA: enzyme linked immunosorbent assays. LFA: Lateral flow assays. PCR: Polymerase chain reaction. *included on the 2018 WHO List of Essential In Vitro Diagnostic. The first WHO EDL issued in May 2018 included cryptococcal antigen lateral flow assay for screening for and diagnosing cryptococcal disease on whole blood, serum and cerebrospinal fluid and tuberculous antigen (lipoarabinomannan) in urine to diagnose disseminated TB in AIDS in those with C4 counts under 100/µl, along with direct microscopy and histopathology, blood culture and bacterial, mycobacterial and fungal cultures. Adoption by hospitals, states and countries is the next critical step to realize the benefits of inclusion of these tests onto the EDL. In addition to advanced HIV disease, patients with severe lung disease, having cancer treatment, organ transplant recipients and many other patients develop serious fungal infections, so easily available diagnostics will be of universal benefit to humankind.